As I have already described here, one of the most inclusive acts of civic resistance undertaken by the militant suffrage societies was the boycott of the 1911 census. The argument was that, if the government was not prepared to grant them full rights of citizenship, women would not fulfill the duties of a citizen. On the night of the census – 2 April – those who obeyed the call either went to considerable lengths to evade the enumerator – or, like ‘Madame Mantalini’, refused to supply the required details on their census paper. in the dark from Paddington and into and round Trafalgar Square, where the main suffragette protest was taking place – and then down Whitehall and out to the west, eventually coming to a halt on Putney Common. As the journalist Henry Nevinson, writing in the suffragette newspaper, Votes for Women, wrote, ‘I had noticed three gypsy caravans….they were driven by women, who whispered me the names of woodland regions not very far off in Surrey. Whether statistics will add them to Surrey’s glorious army of vagrants I don’t know, but they vanished silently down the road, past the decorated windows of the Home Office and the Local Government Board.’ The last office was singled out for mention because it was the LGB – under its minister, John Burns – that was charged with organising the census. Once they had arrived at Putney Common, not exactly deepest Surrey, the women – and Arthur Marshall – all appeared to have had a jolly dinner and reported that they had refused all information to the police who turned up to take their particulars. In the morning they decorated their caravans with placards saying – ‘If we don’t count we shall not be counted.’ and, thus adorned, travelled back into London. Although this excursion doubtless attracted publicity, the police knew quite well who the leaders of that ‘suffragette party’, as they described it, were – and the Marshalls’ details were duly entered on a census form. The other nine women did, however, manage to remain anonymous. It may be that Henry Nevinson was embroidering reality a little – and that it was not the women themselves who were driving the caravans – because a week or so later three men – presumably Rickards drivers – were charged with driving the caravans unlawfully on the turf of Putney Common. 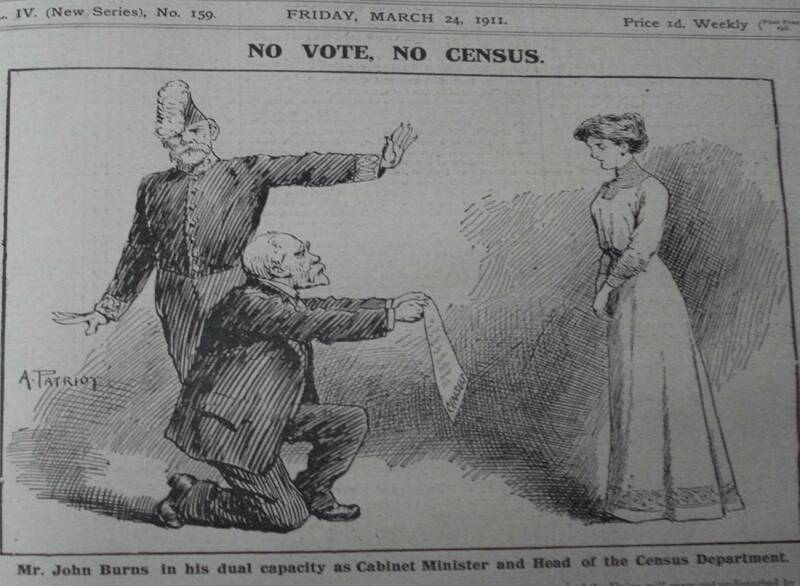 This was one of the very few prosecutions brought that related to the census boycott; women who had evaded or resisted were not charged, the government realising there was little to be gained by giving the protest the oxygen of publicity. However, the local Putney magistrate clearly thought the case a nonsense and it was dismissed with the defendants merely having to pay 2s in costs. And the image painted by Nevinson of the caravans with their bohemian crew remains in the memory. This entry was posted on August 20, 2012, 12:48 pm and is filed under 1911 Census, Suffrage Stories. You can follow any responses to this entry through RSS 2.0. You can leave a response, or trackback from your own site.